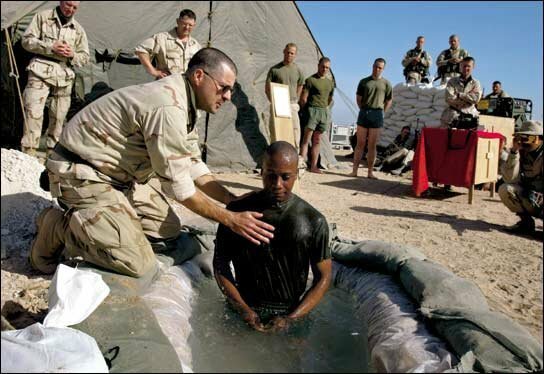 I have been researching the role baptism plays in the Christian experience. I ran across your web site (along with many more) on the subject. I understand that your church believes that baptism is necessary for salvation. The first question I have regarding your views is an entirely practical one. If an area or region of the world can be shown to have insufficient water resources for the baptism to take place, does this nullify the ceremony. Since God has control of the rain and resources, if he saw this as a heaven/hell issue would he provide water for the ceremony? He would seem to be respecting one group of people (those with vast water resources) over poorer regions of the world (say Darfur today or Ethiopia about 10 years ago). This scarcity issue would also have applied to the Inuit (Eskimo) peoples of the Arctic for thousands of years during the harsh winters. My second question is in regard to the need for a third party involved in the salvation process. The implication here is quite obvious: if a baptizer is unavailable or unwilling, the person desiring salvation has no hope of attaining forgiveness of sin as one cannot baptize oneself. While this scenario is unlikely, a POW in a Muslim country could easily find him or herself in this situation. And lastly, I understand that your organization grew out of the reformation (or restoration) movement of the early to mid 1800's. If one argues that the 1st century church saw baptism as a necessary act, and somewhere around the 3rd or 4th century this practice failed to be practiced as God intended and only after Thomas and Alexander Campbell correctly interpreted scripture was this practice reinstated in a biblical way, this implies that all of mankind who died between 500 A.D. and 1850 went to hell. Is this the position of your church? I really appreciate your help with these questions. I wish I could believe that you were actually searching for answers and not using questions as a means to promote your view. It reminds me of the Pharisee's attempts to trip up Jesus. "Then the Pharisees went and plotted how they might entangle Him in His talk" (Matthew 22:15). I not nearly in the league of my Master, but let me attempt to show the holes in your arguments. First, you set the stage as if the necessity of baptism is never mentioned in the Bible, that it is only the strange conclusion of a few. Such is exceedingly strange for a practice that all Christians underwent. "Or do you not know that all of us who have been baptized into Christ Jesus have been baptized into His death?" (Romans 6:3). Being connected by God to the death of Christ, I guess it would only hold as much importance as Jesus' death upon the cross. Perhaps you don't consider the removal of sin to be very important, but Ananias thought it shouldn't be delayed. "Now why do you delay? Get up and be baptized, and wash away your sins, calling on His name" (Acts 22:16). When Peter was asked what the Jews should do, he stated, "Repent, and let every one of you be baptized in the name of Jesus Christ for the remission of sins; and you shall receive the gift of the Holy Spirit" (Acts 2:38). And to this command we find that "Then those who gladly received his word were baptized; and that day about three thousand souls were added to them" (Acts 2:41). Perhaps they weren't as smart as you to realize that Peter didn't really mean it was that important. But then it was Peter who also said, "Corresponding to that, baptism now saves you--not the removal of dirt from the flesh, but an appeal to God for a good conscience--through the resurrection of Jesus Christ" (I Peter 3:21). Rather than discussing what God has commanded (Acts 10:48), you try to invalidate His command by imagining situations where it might be hard or near impossible to keep the Lord's command. In essence you assume that if you can create an exception to a command given by God, you are justified in relegating God's command to being optional; that is, you, as a human being, can decide for yourself whether you want to obey the command or not. Nor would winter be a great difficulty. Even in the far north people do bathe. A tub of water can be provided when needed. I recall my grandfather, also a preacher, telling of having to have some men chop a hole in the ice of a nearby stream so that he could baptize someone. I sure it was mighty cold, but people have always proven to be resourceful. Like the first question, the second question also attempts to imagine a situation where God's command would be difficult to fulfill and thus "justify" declaring the command to be optional. But like the first, exceptions don't change what was commanded. Men are social creatures. We know many people and things can be arranged. Once again I find the argument humorous because of personal knowledge. I know a young man in the middle of Arab territory who through study decided he needed to be baptized, but he couldn't find a church nearby. He studied with his friends and they all concluded they needed baptism as well. He called me all excited -- the four of them had baptized each other. God never placed a requirement on the person who is doing the baptism. You can always find someone willing to immerse you if needed. In your third question you change tactics slightly. Your basic claim is that if people failed to keep God's command for a period of time, then when they do learn what God requires, it must not be necessary. Here we can go to the Old Testament and find examples that disprove this contention. In the days of Josiah the book of the Law was discovered after being lost for approximately 75 years (II Kings 22:10-13). On hearing the words in the Law Josiah didn't dismiss their negligence in keeping the laws because they didn't know. Nor did God say that those laws were unimportant because the people weren't keeping them. "Thus says the LORD: 'Behold, I will bring calamity on this place and on its inhabitants-all the words of the book which the king of Judah has read- because they have forsaken Me and burned incense to other gods, that they might provoke Me to anger with all the works of their hands. Therefore My wrath shall be aroused against this place and shall not be quenched'" (II Kings 22:16-17). I appreciate very much your responses. I do however take offense to your attitude. I was not aware that the gift of prophecy was still available today so that you may discern my intentions. You insist on calling my questions arguments. I was very sincere in my questions as I have been studying with a local group for some time. I am trying to reconcile questions that I have had posed to me by family members of another belief. I have done some reading of the references you sent me. I have a few more comments to clarify my investigation. You seem to take exception to people applying the scientific method to your teachings. As you are well aware not every religious organization (and there are too numerous to name) interprets the scriptures as you do. There are theologians from all different interpretations of scripture. Since I have many different views being presented to me, I try to apply logic to the different views and see which ones hold up. Now since you are totally convinced of the correctness of your belief system, the scenarios which I laid out are inconsequential. 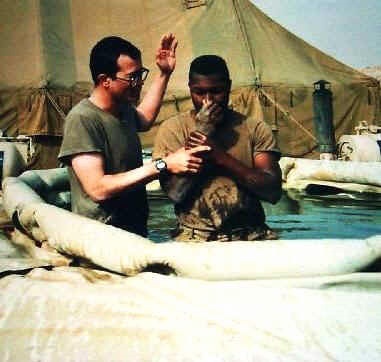 You sent me a picture of a soldier being baptized in a desert. Does this prove that all desert inhabitants can participate at this location? Of course not. You supplied me anecdotal evidence of baptisms happening in difficult places. Does this imply that all areas of the globe where water is in short supply can be accommodated the same way? I would recommend you study the Bushmen of Africa. They get their water from eating melons and from the dew on the grass. The rainy season is extremely short and there is NO surface standing or flowing water for most of the year. How many mission trips has the church of Christ targeted at this tribe? I hope you can see my dilemma. You may argue that even though rainfall is low 100-200 mm per year in the area I just described, they have a small window of opportunity during the short rainy season. While I would agree with you, it is not the same opportunity we have in developed countries. The money and resources needed to overcome this inequity are vast. The church of Christ could send a missionary there but only during the one month they have rain enough to produce pools for baptizing. Is this not troublesome for your interpretation? Doesn't this seem to contradict the thief on the cross experience we read about in the gospels? While this thief was probably under the old law (however, Jesus did die before him), I doubt he had followed the law perfectly to deserve paradise. For example, as part of repentance for thievery under the old law, one was to make amends to the people from whom one stole. Jesus made an exception. He saw his heart and allowed him in in spite of the "rules". There was action on the part of the thief. I think it is clear that he had a penitent heart and that was enough for Christ. So if a penitent heart was sufficient under the old law, why under the new covenant is it actually harder to get God's grace? You continue to avoid what God plainly states concerning the role He selected for baptism in the Christian's life and search out for exceptions to justify stating that baptism can't be necessary. You are correct that I don't have much sympathy for people who use human reasoning to counter God's commands. Peter stated: "Corresponding to that, baptism now saves you--not the removal of dirt from the flesh, but an appeal to God for a good conscience--through the resurrection of Jesus Christ" (I Peter 3:21). Jesus told Nicodemus, "Most assuredly, I say to you, unless one is born of water and the Spirit, he cannot enter the kingdom of God" (John 3:5). Paul stated, "Or do you not know that as many of us as were baptized into Christ Jesus were baptized into His death? Therefore we were buried with Him through baptism into death, that just as Christ was raised from the dead by the glory of the Father, even so we also should walk in newness of life" (Romans 6:3-4). And Ananias told Paul, "And now why are you waiting? Arise and be baptized, and wash away your sins, calling on the name of the Lord" (Acts 22:16). Yet you think that an imagined scenario, which has no basis in reality, somehow negates God's word. And you call it "scientific?" You don't know this by I hold a master's degree in science. I don't get upset with well reasoned arguments. This might come as a shock to you, but your arguments and lines of questions are not well-reasoned. Through your question you argued that someone in the desert might not have access to water. I showed evidence that this isn't the case. You've now turned from the desert and the arctic to the jungles of Africa and claim bushmen have no water. Since humans can't survive without water, I know this is false. I told my boys your argument last night at dinner and they all laughed. As one pointed out, if they are getting water from melons, where are the melons getting water? I even went so far as to check the web, and found what I expected. "Botswana's Bushmen have been forbidden from fetching water from their own borehole reserve after several water boreholes were sunk in preparation for a diamond mine in the Central Kalahari Game Reserve." "The government of Botswana is to cut off water and other essential services to several hundred Bushmen still living in the central Kalahari Game Reserve (CKGR). Aside from basic water supplies, mobile health clinics and handout packages for orphaned children and the aged will also be stopped. The government is urging them to move to relocation camps hundreds of miles away, saying it no longer has the funds to provide water. But rights groups and Bushmen, or San, themselves say they have a right to remain where they are and pursue their traditional nomadic hunter-gatherer existence. But without water, they say, the remaining San will be forced to move whether they want to or not." "Villages ranged in sturdiness from nightly rain shelters in the warm spring, when people moved constantly in search of budding greens, to formalized rings when they congregated in the dry season around the only permanent waterholes. Early spring, a hot dry period following a cool dry winter, was the hardest season, after autumn nuts were exhausted, villages concentrated around waterholes, and most plants were dead or dormant. Meat was most important in the dry months, when wildlife could never range far from receding waters." Notice the reference to waterholes. There is water available. It appears the government is creating problems by cutting off access to waterholes and thus to water in hopes of forcing people to move, but it remains that water is available in the area. If it weren't they would move as the quote person stated in the BBC article. My point remains, which you have not addressed, is that even if an exception could be found, it does not negate the command given by God. Your exceptions remain imaginary; they have no foundation in facts. And they certainly don't prove that it is harder to have access to God's grace under Christ's Law than under the Law of Moses. More importantly, you have no excuse for remaining disobedient to that Law. You don't have any of the impediments that you imagine for others. Yet you moan about how "difficult" God has made it to be saved from your sins. For shame! "What about the thief on the cross?"